Pickle is such a great word. I love its air of transformation, its fortitude. It defies the odds. A pickle is something that’s lived two lives and perseveres, salty, for *you*. And yet, the colloquial expression, “to be in a pickle,” means you’re in difficult situation. I can see that being stuck in a briny solution, your fluids being drained out of you as salt works its magic, would present a problem for you. But pickle, in my house, is also a celebratory word. It means I’ve secured something like French haricot-style skinny green beans or tomatoes or, say, a few pounds of Korean cucumbers that miraculously showed up fresh and pretty at Sunrise Market the other day. Yay for greenhouse gardening! My husband, being an East Coast boy, hankers for the half-sour, or “new,” pickles one gets at Jewish delis in New York (and, if you’re very lucky, Northern California). The ones made by Bubbie’s are all right, but nothing like homemade. So I decided to surprise him — fresh home from a week of eating British food (ugh), mostly at a cafeteria in Cambridge (UGH!) — with some love pickles. They won’t be ready for a few weeks, but he can at least look at them and dream of pickle heaven. My dill pickles were made without vinegar in the Mittel-Europe style. Instead, I use whey made from organic local yogurt and a salt brine. As with the sauerkraut, I don’t feel confident about my recipe, which was cobbled together from several sources, to share it until I’ve tasted the pickles, but I will once I can prove no one will die eating these beauties. That would be a pickle, indeed. And speaking of which, I will literally be in a pickle come April, when I begin my certification as a Master Food Preserver. Oregon State Extension, housed locally at our fairgrounds in Eugene, has an excellent program, operational for almost 30 years, for disseminating information about food safety and preservation during the summer months. Volunteers in the Family Food Education/Master Food Preserver program receive over 40 hours of in-house training, take a state exam, then volunteer for another 40 hours per season handling questions from the community on a hotline and at workshops and booths at our many local venues for such things. Since the training requires a full day once a week for a few months, I normally wouldn’t be able to devote the time, but since I’m now only (only!) working on my dissertation and not teaching, I am able to do it this year! YEAH! GO TEAM PICKLE! I’m also really excited about being able to volunteer for our community in a way that shares information about my two passionate hobbies: cooking and gardening, and to meet new people. It gets lonely sitting here all day by myself! Canning has such a devoted niche of followers, and there’s something kind of exxxxtreme sports about it, too. It’s like the snowboarding of cooking. During my interview for the program, one of the women in charge urged me to take her class on canning fish. Canning FISH? That is so badass. She looked like a sweet, grandmotherly type, but I could just tell she had a can of sardines tatooed on her bicep and could stick her bare hand in a pot of boiling water to retrieve a Ball lid without even flinching. And this, this is what I yearn to become. My first college roommate was a kooky vegetarian save the world hippy-type who is now a kooky vegetarian save the world hippy Ph.D. head of something important-type. I love her and always have, which means I would tease her mercilessly. We would monitor her activities and giggle at the horror of it all. Of all the fascinating things she did, cooking was absolutely the best. On Saturdays, she would bike down to the farmer’s market and buy glorious vegetables and fruits, then cook them up with no salt or sugar or fats and try to share them with us. Oishiku-nai… our Japanese friend would whisper to me when she left the room, it is not delicious! One of the funniest things she ever said was “if life gives you apples, make applesauce!” I absolutely love the irony of having a life full of luscious, red, crunchy, wisdom-bearing fruit that you would then smash to a pulp and cook until brown and goopy. Ah, but I’m sick like that. So life gave me cabbage and I thought of my roommate’s lesson. Sweet, pure, pale green cabbage, heavy and bright. I saw no reason not to slice it to ribbons, torture it with salt, and then leave it to stew in its juices. 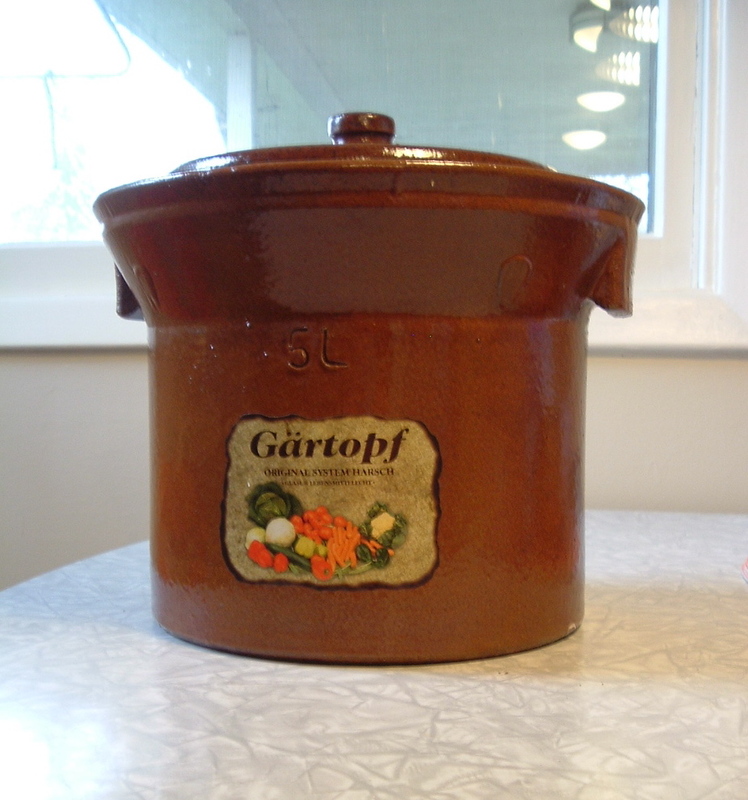 For life had also given me a totally kickass five-liter Gärtopf pickling crock. OK, it was actually my second college roommate, my ex-boyfriend, dear friend, and cook extraordinaire in his own right. He mailed me one last year for my birthday. I helped him make sauerkraut in his crock last fall, and had a chance to sample the wares on my way back to Oregon last winter. Wow. We made choucroute garni with the jar he gave us, and I thought I could sit there and eat the wine-baked sauerkraut for the rest of my life. I liked it even better than the smoked meats that are the raison d’être of that dish. So I decided I needed my own 5-8 lbs. of sauerkraut. I posted my mother’s least favorite post a couple of weeks ago — the one where I remember the crock pot and smelly sauerkraut-and-kielbasa growing up. (Sorry, Mom. But remember, I do owe everything I know about cooking to you, and I *still* love you.) She was duly surprised that I was going to make sauerkraut. Then I called my grandma, who was also surprised that I was going to make sauerkraut, not because I had pooh-poohed the crockpot sauerkraut on a regular basis while growing up, but because her own father made sauerkraut when she was growing up. Apparently, homemade sauerkraut was a staple in their house. So I’m kind of excited that it’s a multi-generation tradition for me, even with the Times of Trouble in the middle. So it’s made, and so we wait. I added juniper berries and caraway, in honor of my great-grandfather. If the sauerkraut turns out well, I’ll post the recipe, which is a bit tricky with the measurements and particular to the Gärtopf crock, so I’m not sure if anyone will find it useful but a few weirdo picklers like me. If it’s oishiku-nai, I’ll just try to shove it off on my friends. And p.s. 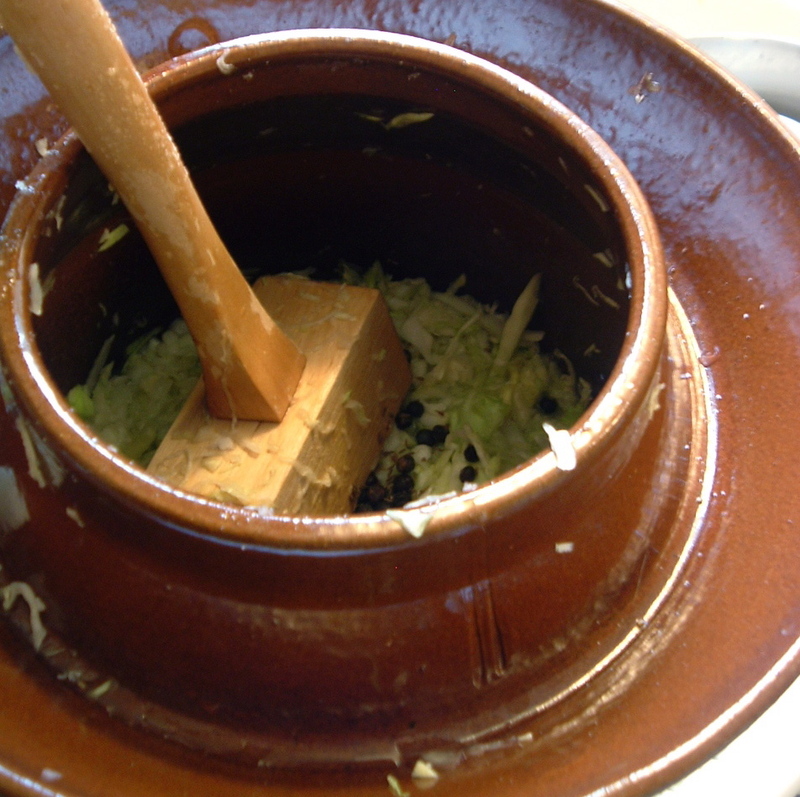 homemade sauerkraut, like all naturally fermented foods, is good for you. I’m obligated to say this as a modern-day food blogger, especially after I’ve dissed healthful cooking in my sordid past. Yum yum. Use 3 T. of canning salt per 5 lbs. of cabbage. If you add spices like juniper or caraway, be sparing, since it’s a pain to pick out the former and the latter really packs a flavor punch. After you slice the cabbage thinly, be sure to press it/pound it down until there is a good layer of liquid over the cabbage to cover it completely in the crock or jar. If you’re using a crock like mine above, follow the instructions that came with the crock to insert the weights. 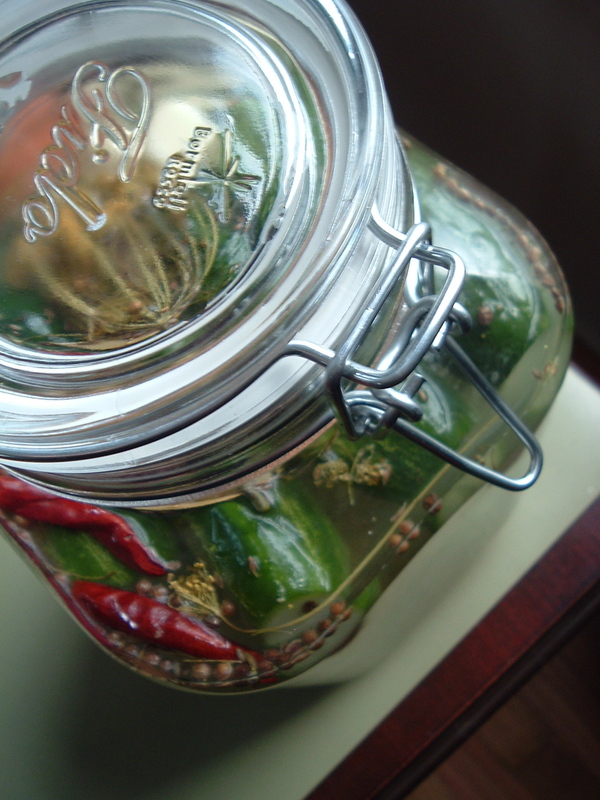 If you’re using a jar or crock without weights, place a ziploc bag filled with brine (1.5 Tbsp. canning calt per quart water) atop the cabbage as a weight, cover jar with a clean towel, then put it in a large brown paper bag (to preserve color and vitamins). Store in a relatively cool place (65-68 degrees is ideal, and avoid fluctuations in temperature in a place like your shed) until done to your liking. I usually wait about 3 weeks in cooler weather. Hot weather will make it process faster. Check after a week or so and then every few days, skimming off scum from top, if necessary. 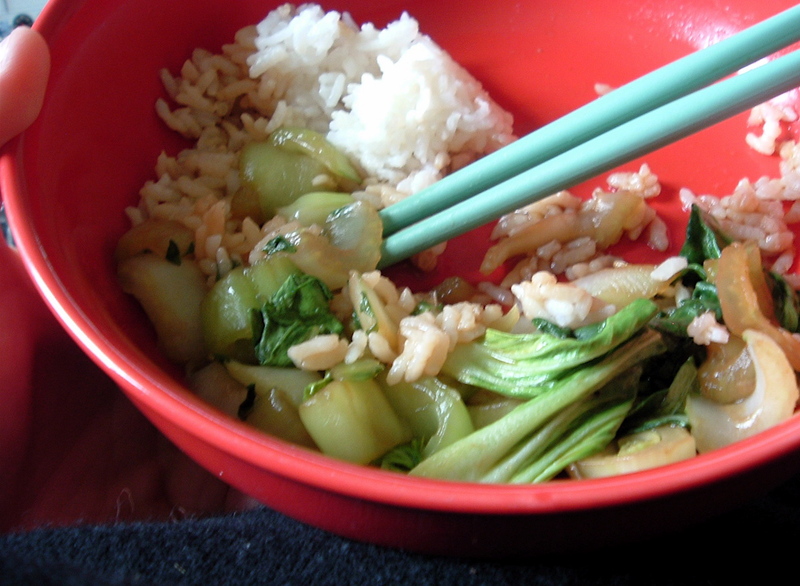 Bok choy stirfry for lunch. Just some dark soy and Chinese cooking wine. Just to show how I suffer for my sins. When I eat garlic, it lingers on my breath for days. For some reason, I am extra sensitive to its effects. It oozes out of my pores. I leave a faint (or not so faint) whiff of garlic as I breeze through a room. Because this is unpleasant to my close associates (read: my husband), I am forbidden to indulge in some of my favorite binge eating. Do other people do this, too? I wonder what the taboo foodstuffs are in other relationships. Sometimes, I dream of being single again. When I lived alone, I used to roast a head of garlic or two and spread the creamy, carmelized cloves on hunks of baguette. Now I just save these gloriously gluttonous moments for when Retrogrouch goes away for several days. I’m very responsible about it, too. I plan for mid-week, so I’ll have a couple of days to clear the stuff out of my system. This week, I decided to binge like a mofo. I started planning for a Thai garlic pepper chickenfest. I haven’t had much chicken since I taught the food politics class in the fall. The articles we read, and the papers my students wrote, really made me re-evaluate eating cheap chicken. But suddenly, I wanted good chicken, and I wanted it with garlic, and I wanted it NOW. 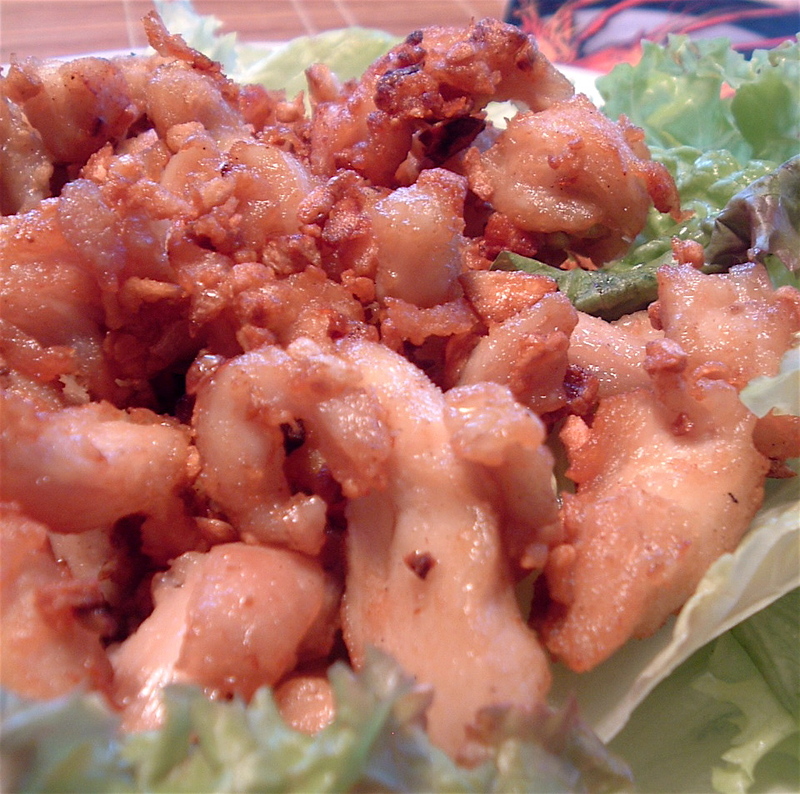 One of the miracles of Thai food is garlic pepper squid — squid flash-fried with white pepper and a bit of coating, then mounded over lettuce leaves with a huge pile of fried, chopped garlic. A friend took classes with the celebrated Bay Area Thai cookbook author and teacher, Kasma Loha-Unchit, and then he practiced on us. My eyes nearly rolled back in my head when he introduced us to this dish. I soon discovered you can make this with any seafood or meat, but chicken is particularly good. I think tofu would work as well, but since it takes a longer time to fry up golden than meats, be sure that the pieces are small. And by all means, check ahead to confirm that your dining companions and loved ones are ok with garlic eau-de-cologne. And sorry, sweetie, I know you’re in England, where the food is not exactly jolly good, and I know you love this dish, too, but believe me, I’m doing it for our relationship. Slice chicken breasts into thin strips. Chop all the garlic by hand into small pieces. Smashing the cloves with the back of a cleaver first will help make this process easier. Add to bowl with chicken. Add rest of ingredients to bowl, and mix thoroughly, being sure that each piece of chicken is coated well. The chicken and garlic will look dry. If it looks wet, add a bit more flour. Fry chicken in several batches to avoid over-crowding in a wok with about a cup or two of vegetable oil. Watch carefully, since the garlic can burn. When chicken and garlic are golden brown, remove to dish with paper towels, then transfer to platter lined with lettuce leaves. Between batches, be sure to remove ALL stray garlic pieces with a fine strainer so they don’t burn in the oil. The oil can be cooled, strained and reused in stirfries, since it will pick up a nice garlicky odor. Serve with other, more reasonable dishes with vegetables and jasmine rice. Or, if you’re completely alone and without hope for future alliances, half the recipe and serve with kimchi radish pickles and rice. I like to wrap up the chicken pieces in the lettuce with bits of garlic. Heaven. Serves 2-3, if you can restrain yourselves. Retrogrouch is away at a conference and I’m enjoying the quiet house. Didn’t do a thing for Easter, even make my grandma’s Easter soup with kielbasa (though I may still do it, having the ingredients in the refrigerator). I just don’t feel like cooking for myself. I did take one for the team and attempt to eat at Kowloon in North Eugene this afternoon. Now I’m so sick to my stomach I can’t even fathom dinner. Ugh. That is NOT a good restaurant. I should have known it wouldn’t be good when I saw that all of the lunch specials were either chow mein, fried rice, fried things, or a combination of the three. So, I’ll give you a Easter Monday story and a recipe for next year. First, the story. In Hungary, on Easter Monday, the boys sprinkle perfume on the girls and sometimes douse them with water, chanting a little rhyme that claims the girls are flowers and they need water so they’ll bloom and not wilt. A reminder to drink your 8 glasses a day, if you don’t live in Hungary. Second, a recipe. Easter was too early this year to take full advantage of an old way to dye Easter eggs. 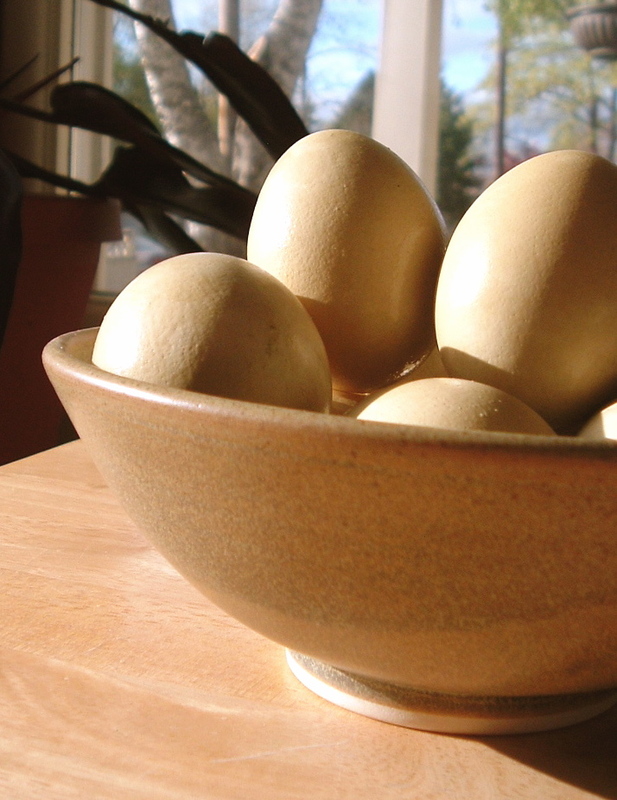 Apparently, the old-timers used dandelions to dye their eggs. After my sister told me last year that her husband’s grandfather’s favorite eggs were the dandelion-yellow ones, I went out and did a U-pick on my garden in the rain. It solved two problems: getting rid of the seed heads from those lawn-gobbling dinner plate-sized weeds, which grow monstrous in Eugene, and it gave me purty pale yellow Easter eggs. I boiled about two cups of the flower tops for about 15 minutes, then added the cooked eggs and let them soak for about 6 hours. The picture doesn’t really show the color well, but they were a lovely pale yellowy green with slight mottling from contact with the dandelion heads. The granola sites say that if you boil the root of the dandelion plant, you’ll get magenta dye, by the way. Maybe next year. What happened to the Jefferson St. Grill on Jefferson and W. 19th, and even more importantly, what will happen with the space? It just opened last year and friends say it’s now closed. We have eaten there a couple of times, and although it’s unquestionably nicer than Jake’s Place, which preceded it, there was something dissonant about a moderately upscale restaurant (e.g., prime rib, full bar) next to a convenience store. Or maybe it was the big OREGON LOTTERY sign on the restaurant marquee. I’m going to cross my fingers that a neighborhood restaurant will open up that has more of a neighborhood feel — a lower-priced menu, more casual food (but not pub food, or wraps-n-sprouts in them, since we have way more than we need of those types of restaurants). It always felt too formal for us to eat there mid-week, on a budget, and yet too casual to go there when we wanted to splurge. It just didn’t fit the space. I guess others agreed. Why not a sweet little bistro along the lines of The Vintage? Or even a café that serves soups and sandwiches? It’s too far away from downtown to be a bar of any weight or traffic, but it’s a busy and central enough location for folks commuting from work downtown or from the university to grab a bite. My husband had two imaginary friends when he was little: Porkchop and Meatball. I decided to give them an honorary banquet yesterday. Or rather, eat them at an honorary banquet yesterday. * Inspiration is a treacherous thing. And yet, it all looks so normal, donnit? The discreet charm of the bourgeoisie. We had over a colleague from his work, and the evening was full of wine. I’m now feeling too full and lazy to post recipes, so I won’t. And I’m so full of CSA love right now…I had never prepared Russian kale before, just regular, and it’s much more tender and pretty, with ruffly, small leaves. I used CSA dill in my couscous, their carrots in my purée and in the meatballs, their garlic and their kale, and their lettuce for the salad. Yay for local vegetables! Yay for nutritiony goodness! The Russian kale was fantastic. 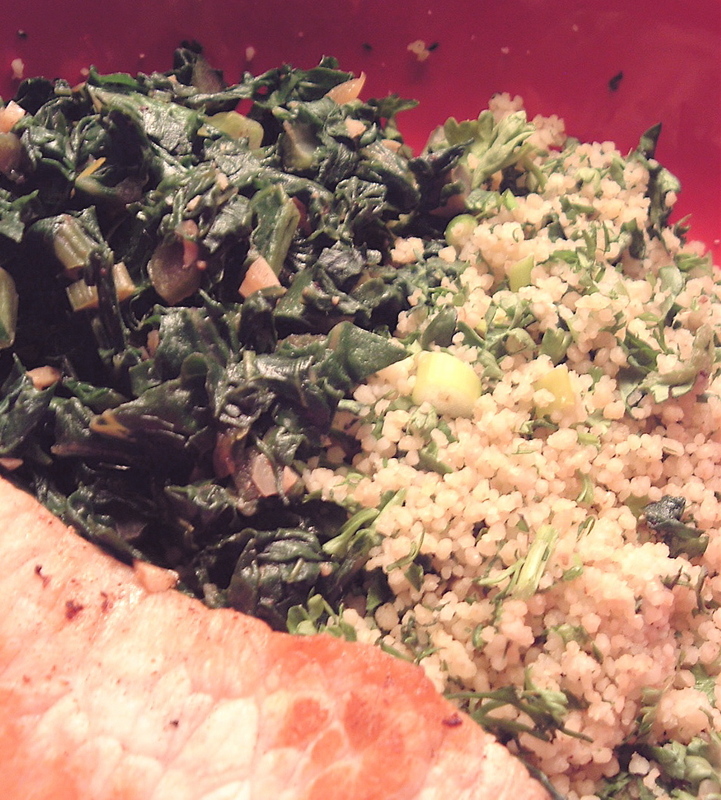 I seared the pork chops, then sauteed the kale in the same pan, so it picked up the drippings. If you’re not going to simmer greens in pot likker with ham hocks, this is a method I would absolutely suggest. *Hey, my imaginary friends were cats. It could be worse.